Just saw the WeHo report that David Arquette was in a bad car accident- hope he is ok. Having been in one myself I get super anxious when I read about accidents now, and I know mine was not considered a bad one- so hope everyone is ok.
We’re hearing via readers about a bad car accident on Doheny a few minutes ago and via our friends at TMZ that it involved David Arquette. The actor was injured in the head-on collision and is being rushed to the hospital. TMZ has a number of photos of the scene and of the injured actor, who was lying on the ground bleeding as fire trucks rushed to help. 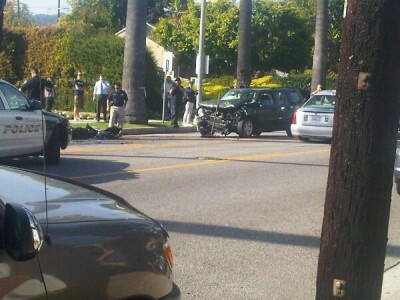 Weho Daily reader Lauren Brokow said the accident was on Doheny near Keith. A witness tells TMZ … David was behind a car that stopped suddenly. David then swerved to the left to avoid hitting the car and went into oncoming traffic. David slammed into a car going in the opposite direction. TMZ said they heard from his rep who said that he is OK but is indeed going to the hospital.